The San Francisco 49ers had gotten off to a slow start in the 1966 NFL season. They were 0-2-1 as they prepared to host the powerful Green Bay Packers on October 9. Following their first winning season in four years (7-6-1 in ’65), Head Coach Jack Christiansen’s team had plenty of talent on offense but also had a suspect defense and was coming off of two big losses to the Colts and Rams. Tenth-year QB John Brodie received a big contract extension in the offseason but endured two rough performances in those defeats. 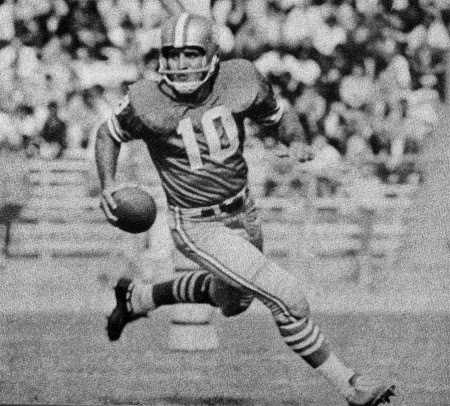 George Mira (pictured above), a third-year backup out of Miami, was getting his first start of the season at quarterback in place of Brodie, with the hope that his darting, scrambling style would prove effective against the vaunted Packers defense. The prospect of facing Head Coach Vince Lombardi’s Packers did not promise any relief for the 49ers. Green Bay was the defending NFL Champion and off to a 4-0 start. QB Bart Starr didn’t typically throw often, but he was efficient when he did and had tossed six touchdown passes as opposed to just one interception thus far. The veteran backfield duo of FB Jim Taylor and HB Paul Hornung was wearing down, but the receiving corps was effective and the defense solid from front to back. If there was one discordant note for the Packers coming into San Francisco, it was that they had been having recent difficulty in games at Kezar Stadium, having not won there since 1963 (in 1965 they tied the 49ers in the last game, which forced a playoff for the Western Conference title with the Colts). There were 39,290 fans in attendance at Kezar Stadium on a sunny afternoon. In the first quarter, the Packers drove to the San Francisco 32 yard line as Taylor and Hornung ran to good effect, but Don Chandler missed a 39-yard field goal attempt. Following a San Francisco punt, Green Bay moved even deeper into 49ers territory on a series highlighted by Bart Starr throwing to split end Max McGee for a 39-yard gain, but, after getting to the eleven, had to settle for a Chandler field goal try that was successful from 18 yards. Two possessions later, Mira’s first scoring pass came on a play when his mobility was put to good use. He first ran to his right and then reversed field to avoid the rush and threw on the run to HB John David Crow at the Green Bay one who then dove into the end zone for a 27-yard touchdown. After the teams traded punts, Mira was shaken up in the second quarter and had to leave the game briefly. When John Brodie came onto the field as his replacement, he was greeted with a shower of boos from the home crowd. He did complete a six-yard pass to FB Ken Willard, but a 41-yard field goal attempt by Tommy Davis was unsuccessful with 29 seconds left in the half. Still, the Niners carried a 7-3 lead into the intermission. The Packers had the first possession of the third quarter, and facing second-and-eight at their own 47, the 49ers put on a heavy rush and dumped Starr for a 12-yard loss. Starr was hit again on the next play, and this time it forced a fumble that was recovered by LB Matt Hazeltine, who then proceeded to run 22 yards for a touchdown. The successful PAT by Davis put San Francisco ahead by 14-3. On the next series, the Packers responded by scoring on a quick three-play, 56-yard series. Starr threw to a wide-open Hornung at the sideline for a 43-yard touchdown. Chandler’s extra point narrowed the home team’s margin to 14-10. Mira was back behind center for the 49ers, but they went three-and-out and had to punt. Starting at their own 42, the Packers moved quickly into San Francisco territory. Starr completed passes to Taylor for 14 yards and flanker Carroll Dale for 24 down to the 15 yard line, but the drive stopped there. Chandler booted a 22-yard field goal that made it a one-point contest. After another punt by the Niners, the Packers appeared to be driving toward a score when, on the first play of the fourth quarter, Starr was intercepted by safety Elbert Kimbrough, who returned it 44 yards before finally being hauled down by Jim Taylor at the Green Bay 37. Mira was immediately sacked for a nine-yard loss, but two plays later, and following a 38-yard run by the nimble quarterback, the 49ers capitalized when he tossed an eight-yard touchdown pass to Crow. Rather than the Packers potentially taking the lead, the Niners were up by 21-13. The Packers bounced back by driving 69 yards in four plays that ended with Starr throwing to Dale for a 38-yard TD. Don Chandler’s extra point again made it a one-point contest and there was still plenty of time. Green Bay’s defense proceeded to make a big play when LB Dave Robinson intercepted a Mira pass and returned it 32 yards to the San Francisco nine. The 49ers kept the Packers out of the end zone on three plays and, following an offensive pass interference penalty, the visitors were backed up to the 19 and Chandler missed a 26-yard field goal attempt. Brodie again replaced Mira at quarterback and the 49ers put together a long, time consuming drive. HB Dave Kopay had a 25-yard run and FB Ken Willard also ran effectively. Facing fourth-and-one at the Green Bay two, San Francisco was unable to convert, but there was only a minute remaining as the Packers took over just two yards from their own goal line. Green Bay was unable to do anything offensively in the waning seconds and the 49ers came away with a 21-20 upset win. The Packers ran up more total yards than San Francisco (368 to 248) and each team generated 17 first downs. However, Green Bay also led in turnovers with three, to two suffered by the 49ers, and missed opportunities – particularly those that also ended with failed field goal attempts – proved fatal to the defending champs. George Mira completed 9 of 21 passes for 104 yards, but two of them were for touchdowns against one interception and he also ran for 46 yards on three carries to lead the club. Ken Willard gained 43 yards on 14 rushing attempts, Dave Kopay added 42 on only four tries, and John David Crow (pictured at left) had 9 carries for 23 yards to go along with a team-leading 5 catches for 53 yards that included two TDs. For the Packers, Bart Starr was successful on 18 of 26 throws for 287 yards and two TDs as well as the one costly interception. Jim Taylor ran for 54 yards on 16 carries and caught four passes for 39 more yards while Paul Hornung rushed for 30 yards on 11 attempts and had three receptions for 51 yards and a touchdown. Carroll Dale gained 86 yards on his four catches that included one for a score. 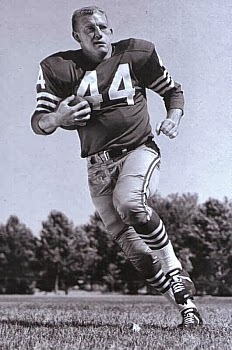 The 49ers won their next two games, with John Brodie back at quarterback, but ended up with a 6-6-2 record to place fourth in the Western Conference. George Mira ended up completing 22 of 53 passes (41.5 %) for 284 yards and five touchdowns with two interceptions while chafing in Brodie’s shadow. Green Bay recovered to top the conference at 12-2 and again win the NFL title. Moving on to the first Super Bowl, the Packers defeated the AFL Champion Kansas City Chiefs. Bart Starr threw just one more interception over the remainder of the season as he led the league in passing and was a consensus MVP selection.